Click here to see the MLS listing and photos & here for floor plans of this home. Additional information not found on the MLS can be found below. Stylish sophistication meets the warm comforts of home here at the masterfully designed 258 Long Hill Drive. 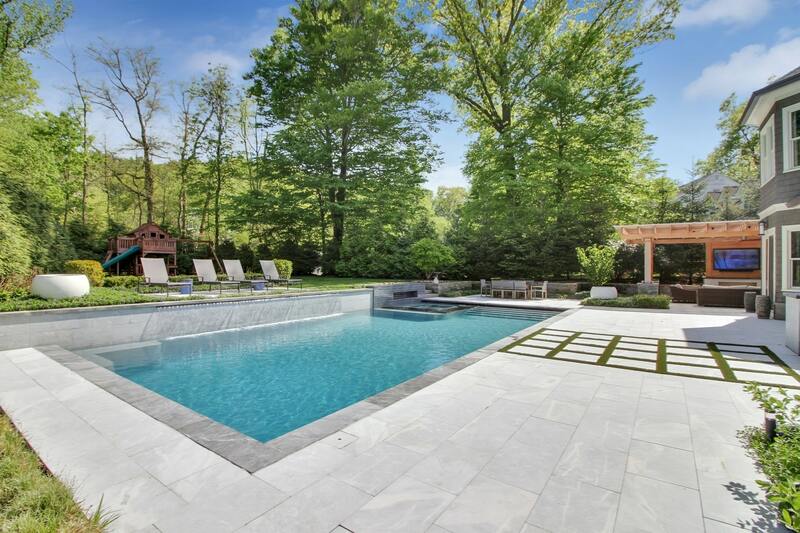 Serenity and privacy abound in this idyllic setting, feeling far from the world yet just minutes from the Short Hills NJ Transit Train Station with convenient service to Hoboken and New York Penn Station. 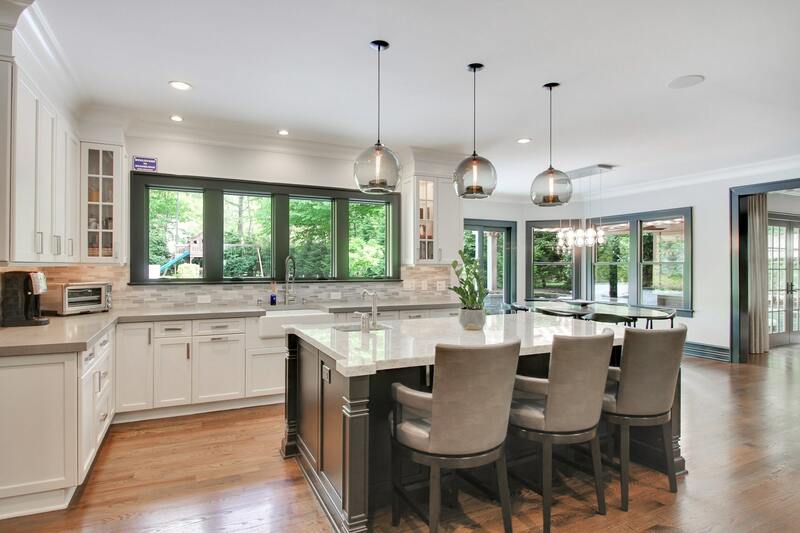 Thoughtfully designed by renowned architect Thomas Baio AIA and built by award-winning builder Highgate Hills, this traditional center-hall colonial offers modern amenities & an open floor plan with clean lines & luxurious scale. The architectural drama astounds with the spectacular double height entry set on handsome wide-plank oak floors, generously sized dining & living room all with impressive moldings and trim work. 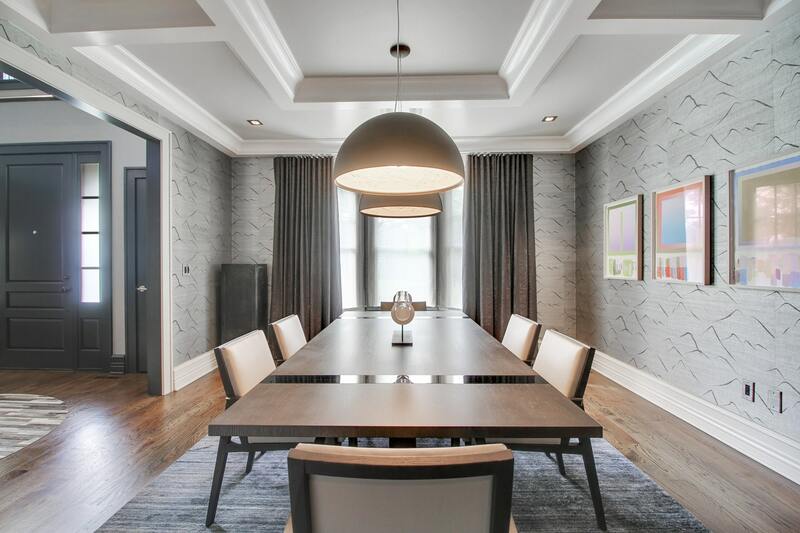 The eye-catching dining room is stylishly framed with beautiful ceiling trim, custom drapery & elegant wall covering. Around the corner is a generously sized wine refrigerator perfect for an avid entertainer and most discerning collector. Across the foyer is the ultra-chic living room with masterful trim, shimmering drapes and thoughtfully designed built-ins concealing a bar suitable for the ultimate host. The large family room is open to the kitchen, making it the epitome of effortless gathering. With its wood-burning fireplace, stunning mantle and proximity to the expansive rear patio, this room has incredible flow allowing for seamless entertaining. The pièce de résistance is the gourmet eat-in kitchen & delightful breakfast room. The kitchen’s huge Carrera marble island is surrounded by top of the line appliances, stylish plumbing fixtures & elegantly coordinated pendant lights. A large window above the main kitchen sink overlooks the rear property where the stunning pool and patio create an elegant sight line. The adjacent breakfast area is framed by large sliding doors leading to a wonderful patio with state-of-the-art outdoor kitchen featuring a barbecue grill & dual burners. The other side of the kitchen offers direct flow into the ever-functional, large Mud Room hall with custom built-in millwork lockers & seating. At this end of the home, you’ll conveniently find access to the three-car garage, back stairwell & driveway side entrance. 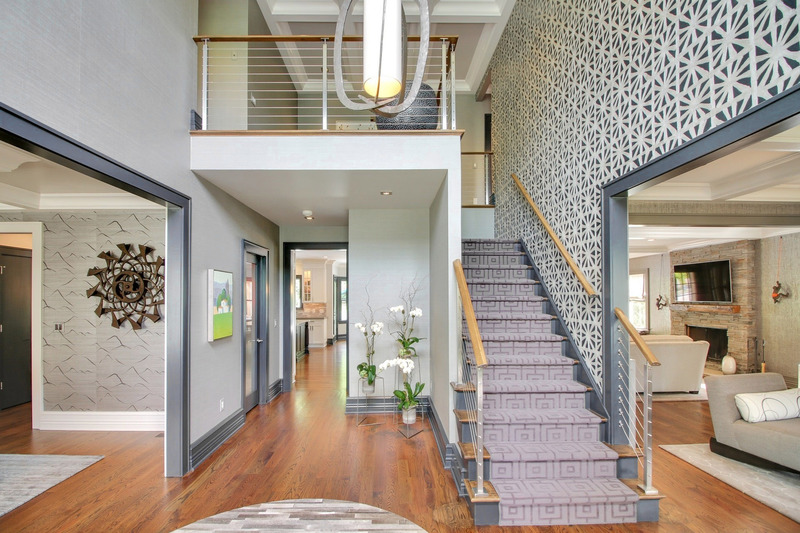 Ascending to the second level of the home, you find double doors leading to the luxuriously serene Master Suite featuring custom draperies on large windows, stylishly designed sitting room with beautiful wall coverings also with custom window treatments. A large elegant dressing room leads to the closets of your dreams with customized cabinetry. 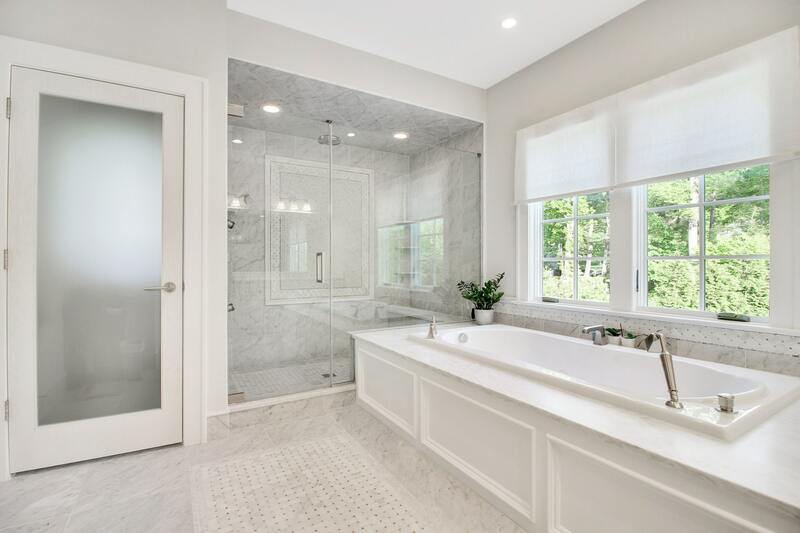 From the dressing area, a solid door opens to a spa-like Master Bathroom with heated marble floors, with top-of-the-line plumbing fixtures, a beautiful jetted tub with large window above and a private water closet. 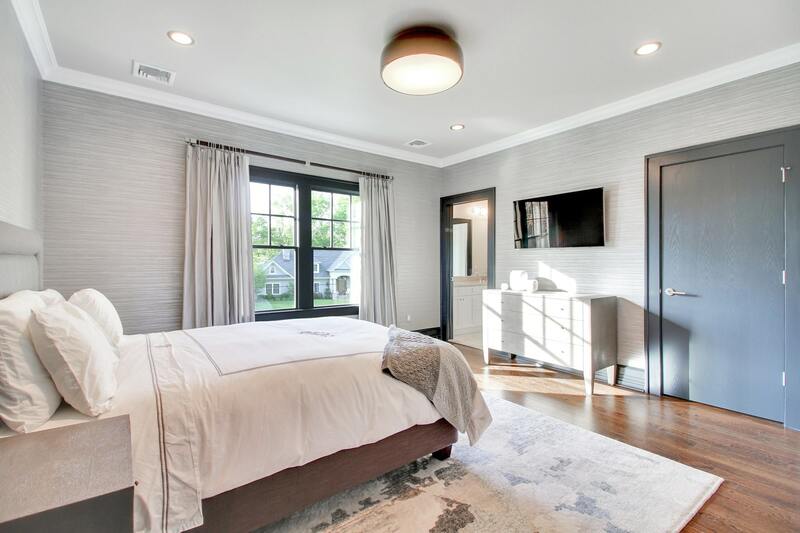 The remainder of the second floor boasts four generously-sized bedrooms, all professionally designed with custom window treatments & beautiful bathrooms, all en-suite. The Laundry Room on this level adds to the thoughtful appeal of the home’s functional layout. The third floor is expansive and the perfect place for those who seek a private & quiet space to call their own. Finally, the show-stopping lower level offers every imaginable amenity including a large exercise room with walls of mirrors. Completing this incredible level are a recreation room with high ceilings, natural light & extensive custom built-ins. Here you will find the seventh bedroom with en-suite full bath. The outdoor stone patio boasts a large barbecue, refrigerator drawers & ice maker. Perfectly situated, the patio ensures that even the largest gathering will feel comfortable. A gunite heated pool and spa with remote-control functions and water feature are the centerpiece of the private fenced yard, punctuated with privacy plantings and garden beds. An outdoor covered veranda with gas fireplace and flat screen TV tops the charts for the alfresco aficionado. The technical systems are exactly what one would expect in a home of this caliber, with state-of-the-art heating & cooling systems, security system and sophisticated music systems. 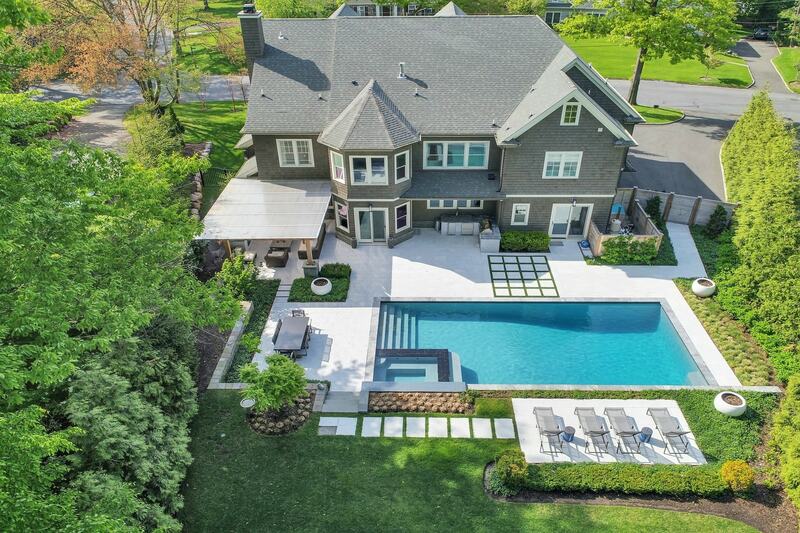 Resting on nearly half an acre, 258 Long Hill Drive is a tasteful balance of masterful design, luxury & classic comfort, awaiting that extraordinary buyer who appreciates fine craftsmanship, stylish design and modern conveniences & all that Short Hills has to offer. We dare you not to fall in love.